This year has seen the rise of the aubergine - in emoji form, obvs. We saw aubergine pool floats and even a service which posts aubergines with a message on to anyone in the world. So is it any surprise that aubergine-tinted nail polish is this season's hottest colour? Don't get put off by the gimmicky nature of it all - it actually looks pretty hot. Try this Nails Inc one in Grosvenor Crescent, £14. Let's be honest, taupe never really goes out of style, no matter what the weather's doing. It's the perfect canvas for some gorgeous minimalist nail art, but equally works as a low-key colour when you're feeling a bit more conservative. Taupe-Less Beach by OPI, £12.50, has a gorgeous, subtle purple tint to it that'll look perf on newly manicured nails. Everyone knows the winter months are for staying in and gorging on chocolate in front of a roaring fire. So why not mirror your hobbies in your nail polish? Jinsoon's Toff, £15 from Net-A-Porter, describes itself as the "dark, delicious shade of cocoa beans", and thus will look perfect paired with a chunky cream knit and a bar of Galaxy. Nom. Grey is a staple winter shade, especially in the UK where it's fashionable to match your nails to the only type of weather we get here in the latter months of the year. But there's oh-so many shades of grey to choose from - way more than fifty, contrary to popular belief - so what's going to be a fashion hit? Well, slate grey never goes out of fashion, and it goes with EV-UH-RY-THING. Leighton Denny's shade Prohibition, £12, is the perfect blend of chic and moody, which'll happily match your aura during your commute on a rainy monday morning. Seriously, when it gets chilly, we can't get enough of grey. Gloomy to some, beautifully brooding to others. Black Diamond by Nails Inc, £15, is on board with helping you express your faux moody nature, whilst the slight shimmer shows people not to take you too seriously. 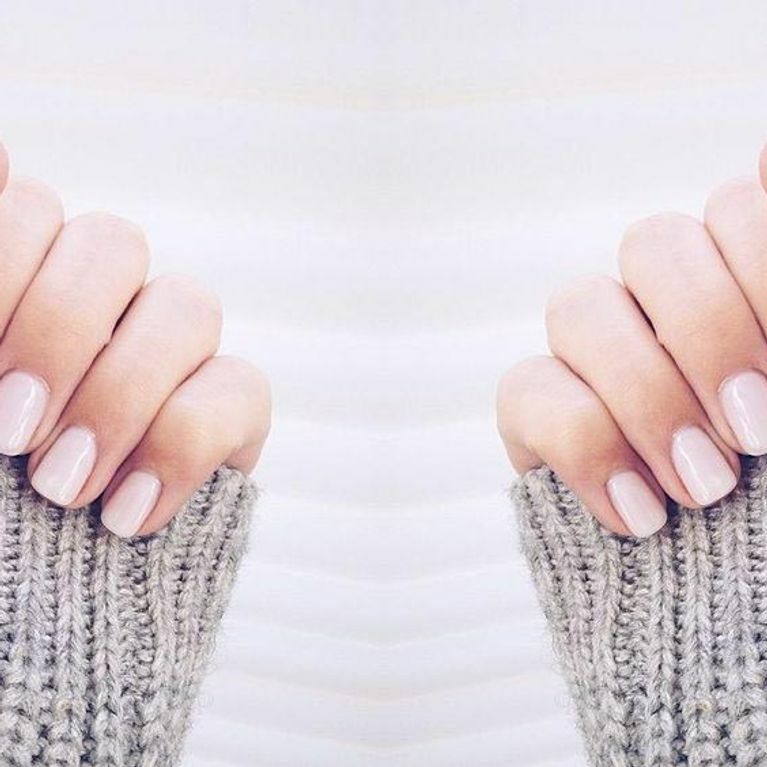 Whilst pastels may be perf for spring and summer, they also work for winter - you just gotta mute them down a bit. A delicate pinky purple can be made winter ready once muted. Try this gorgeous dusty pink from Smith & Cult with a hint of lavender, £19, is just begging to be worn with a soft cashmere knit. And speaking of mute colours, Smith & Cult's shade Subnormal, £19 is also the perfect blend of grey and blue that'll look bright and preppy in a wintery way. Winter wouldn't be winter without a deep dark red polish gracing your talons. And there really is no competition when it comes to what that red shade should be - Chanel Rouge Noir, £18 from Selfridges. No question about it. C'mon, you can't go to a New Year's Eve party without giving your nails a bit of glamour, right? Sparkle is mandatory on NYE. But if you fancy something a little different to the regular gold shimmer, try MAC's Party People, £10 - it's like hundreds of strands of delicate gold confetti fell from the ceiling and landed right on your nails. We don't know a single person who doesn't like rose gold. We own rose gold errrything: iPhone, jewellery, even our hair has a rose gold tint. So it was only a matter or time before this trend stretched down to our fingertips. Help bring your nails bang on trend with Mayfair Market, £14 from Nails Inc.
PSA, everyone: Bright and happy purple is out; muted, moody lilac is in. Jinsoon got the memo - they've created the gorgeously ominous Dandy nail lacquer, £18, so you can give your mani a maudlin makeover stat.